CAMBRIDGE, Massachusetts, February 5, 2013 (ENS) – Researchers at the Massachusetts Institute of Technology, MIT, have filed for patents on a new water purification system that turns the produced water from natural gas wells into drinking water. The team has set up a company to commercialize the process in collaboration with another MIT group that has been pursuing a related system for desalination that could help water-scarce developing countries. 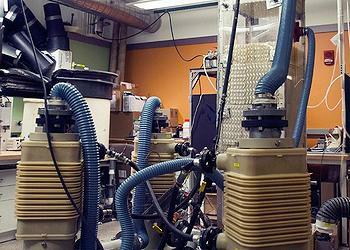 This 12-foot-high system in a lab at MIT demonstrates the new humidification-dehumidification system. The research is the work of a team including MIT postdoc Prakash Narayan, mechanical engineering professor John H. Lienhard V, and collaborators at King Fahd University of Petroleum and Minerals, KFUPM, in Saudi Arabia. Narayan says he expects the first commercial plants could be in operation within about two years. The team sees potential for this technology in the near future. After further development, they say, the process could lead to inexpensive, efficient desalination plants for communities in the developing world. Increased production of natural gas, which burns cleaner than coal, is seen as a crucial step away from the greenhouse gas emissions of coal-fired power plants and toward U.S. energy independence. The MIT engineers say their technology could solve the problem and produce clean water at relatively low cost. The team built a 12-foot-high test unit that has run continuously for weeks, producing about 700 liters of clean water a day. They have tested it using barrels of water from natural gas wells to demonstrate that it produces water clean enough to drink. Water from actual natural gas wells, sent to MIT by the companies that operate them, was run through the system, producing clean, potable water. Their next step is to scale up to a plant about two to three times the size of this initial unit, which calculations show should be an optimal size. The method is a variation of the standard distillation process, in which salty water is vaporized and then condenses on a cold surface; the salt separates out during evaporation. But that process is energy-intensive and costly, because all the water must be boiled, and the condensing surfaces kept cold. In the new process, water well below the boiling point is vaporized by direct contact with a carrier gas. The moist air is then bubbled through cooler water where the purified vapor condenses. But the temperature difference between the warm and cool water is much less than in conventional dehumidifiers, and the surface area provided by the small bubbles is much greater than that of a flat condenser surface, a more efficient process. The traditional version of this process is called a “humidification dehumidification (HDH) desalination system.” While other groups have designed HDH systems, the MIT version requires far less energy than others, the team says. 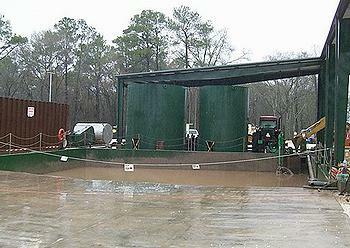 A big expense for the operators of natural gas wells is the ongoing treatment of produced water. It is the largest waste stream generated by the oil and gas industry. In the United States, more than 99 percent of the produced water generated onshore is managed onsite by the operators. Some operators must drill injection wells for produced-water disposal to depths such as 14,000 feet. Smaller operators prefer to send their produced water offsite to a commercial disposal facility. Produced water is typically several times saltier than seawater, making it a good candidate for treatment with the new HDH process. The HDH technology had not previously been the target of systematic analysis, Lienhard says. A leading journal on desalination technology, “Water Intelligence Report,” gave the system the highest rating awarded to any system for dealing with produced water. The scientists said that water and other fluids used to open wells through hydraulic fracturing, or fracking, are a different matter, requiring other kinds of treatment and disposal.